Sneak peek: Funky Dawgz Brass Band brings their New Orleans R & B to town, History of Maryland Politics teaches us a thing or two, Mens Chorus Invitational will have you singing a new tune, free Meditation to keep you centered (as if! 😄), Black Renaissance Networking Event, Bowlero Bowl Grand Opening Party & more, all in your Adults’ Weekend Guide! Did I miss anything? Add it to the comments below! Get your fresh and local produce right here! We love strolling around the Riverdale Park Farmers Market, buying some fresh, local produce, grabbing a bite from one of the vendors and then heading to Town Center Market for a tasty beverage. Learn basic brewing concepts and specific techniques in this hands on, approachable, and fun class. We’ll cover plenty of tips on how to make your home brewing more successful, and how to get the most flavor from your cup. 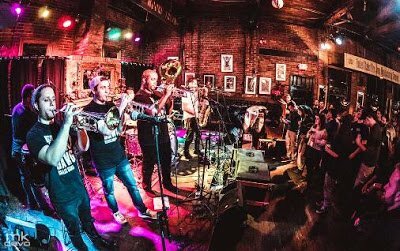 It is impossible not to enjoy yourself during a show as the Funky Dawgz play a contagious upbeat mix of traditional New Orleans R&B, original music, hip hop, funk, and today’s top hits with a brass twist. The concert, which benefits the UMD Campus Pantry, will explore the intimate chamber music of the early works of Shostakovich and Mendelssohn. The UMD Campus Pantry offers food to students, staff and faculty who face the challenges of food insecurity. We in the Omer Quartet find the work of the campus pantry inspirational in the quest to alleviate hunger among members of the UMD community who may go to work or classes hungry. **University Park Elementary School Auction is next Saturday! Get your ticket here! Join us for our Grand Opening Celebration and enjoy free bowling, arcade play, giveaways and more! Celebrate Black History Month with Distinctly Creative, and the opening reception of Black Renaissance — our rotating gallery of portraits featuring 28 local black creatives + entrepreneurs at our Brentwood studio. Tickets include wine and light refreshments. Focuses on learning yoga positions and correct alignment to build strength and increase flexibility. The class includes mindful movements and stretches. The use of props is encouraged. Mindful breath work is also included to balance the practice. Perfect for all practitioners. Head out on for a weekly, free, 5K, timed run. Afterwards, enjoy a post parkrun coffee in The Board & Brew, College Park. All ages welcome! This week we’ll be heading down to Zeke’s Coffee of DC. You’ll get a taste of riding on DC roads for a few miles. There are some hills. Pretty easy ride, you should be comfortable in light traffic, no drop, delicious coffee! About 18 miles RT. Bring lock, cash/cc. Helmets required. Forecast is for more rain so we’ll be watching the weather – will post here if canceled. February is Heart Health Month! University of Maryland Capital Region Health will conduct cholesterol screenings, blood pressure screenings, chest pain center health information, health food demo/samples and more! Students will taste, make and discuss recipes for incorporating therapeutic amounts of medicinal herbs into such yummy concoctions as chocolates, soups, baked treats and beverages. Learn how to use essential oils to: Reduce tension and stress; Promote mental alertness; Assist supporting respiratory health; Sooth sore muscles and joints; Maintain optimal gastrointestinal balance & more! UMD Stand up is a new club this semester full of comedians from comedy groups on campus and newbies alike. We’ll spend the semester meeting weekly to practice material, do workshops, observe other comedians in DC and work on our sets. 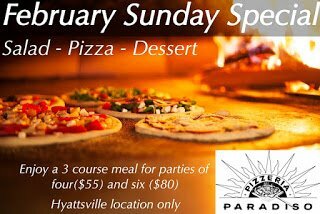 Last chance to try this deal! So! you’ve decided you’ll become a beekeeper.. or you want to understand honey bees to that degree 😉 Beekeeping 101 will afford the attendee a sufficient grasp on the basic tenets of beekeeping. The attendee who partakes in the entire series.. will have been presented the knowledge & information necessary to then begin keeping bees. University Park Elementary School Auction – Get Tickets Now! Searching for a Pediatric Dentist? We checked Out Children’s Choice 👍👍!